Highland dwellers who invented them. Strong Man Scottish Challenge Competition Friday September 7: 10:00 a.m. - 4 p.m.
Sunday September 8: 8:00 a.m. - 4:00 p.m.
Due to time considerations, the Longs Peak Scottish Irish Highland Festival has felt the need to reduce the number of pro athletes invited to Longs Peak Scottish festival to total of (8) competitors. The top (5) from previous year receive the first invitations. After that we will evaluate the pro competitions (based on the Bethlehem rankings. 2019 application deadline date of July 12, 2019 and invite the top (3) applicants based on those rankings. If perchance any of the (5) athletes with automatic invitations do not choose to compete, the number of open spots would increase accordingly. Today, many of these games are recognized Olympic events with both men and women competing. The best guess of their origin is that the games were the ancients' version of today's military physical. In the hand-to-hand fighting of early wars, strength and endurance were crucial for the survival of the clans. 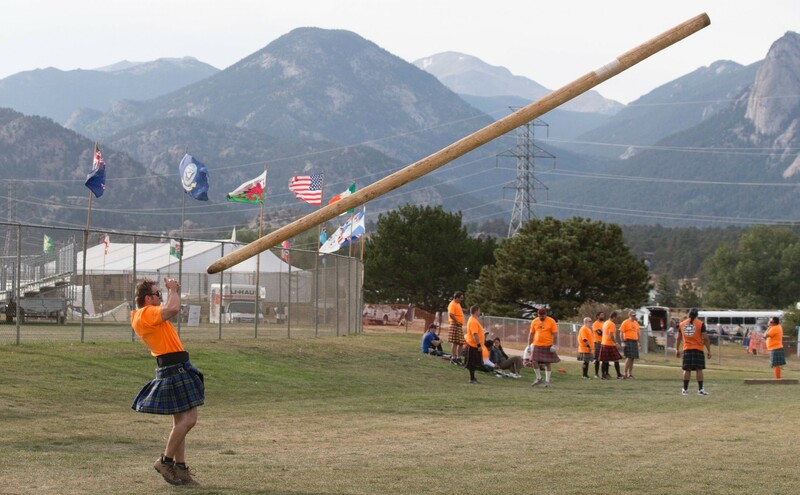 On the Festival field, there will be hammer throws, putting the stone, and caber throwing contests. Come join us and see a mere man toss a 19'7", 140-pound caber end-over-end! The strong man competition is Friday from 10 a.m. to 4 p.m. The Scottish Highland Athletes will have check in 7:30 am for amateur and professional competitiors Saturday and Sunday with a start time for Saturday and Sunday at 8:30 am. to 4 p.m. The heavy athletic professional championships are Saturday with a checkin at 7:30 and start time at 8:30 am to 4 p.m. Longs Peak Scottish-Irish Highland Festival, Inc.